I want to start this review by thanking Titan books for sending me an early review copy, it was very much appreciated and I enjoyed the book. This was a quirky detective novel, which evolved to become a bit of a reversed murder mystery. However I’m not going to lie, I did feel it had some rather large negatives. 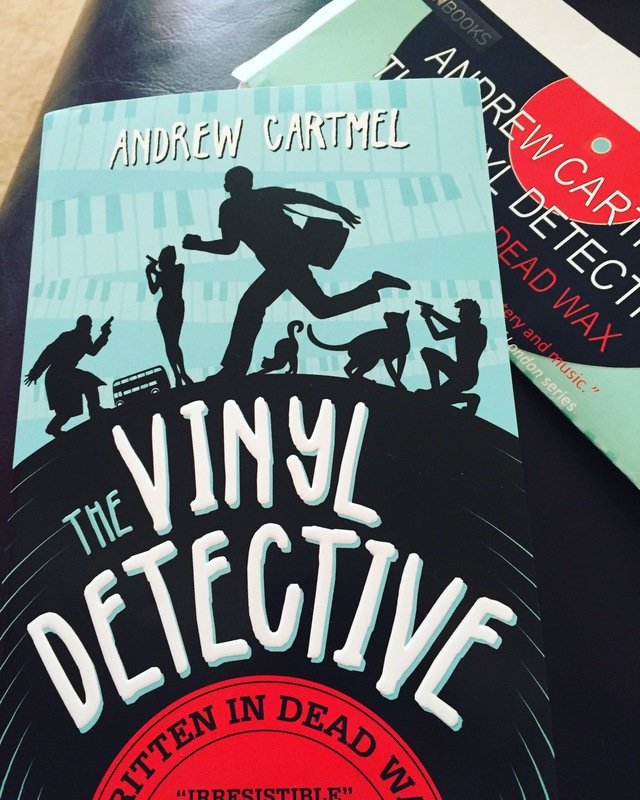 Before this I had never read any of Cartmel’s work so I was going into it was an open mind, and hoping for the best, and very quickly it delivered with a quirky relatable protagonist. The characters have to be the best part of this story, admitted I’ve not read particularly much like this, but the characters just seemed to be so unique, even just the minor ones. Nevada was by far my favourite character from the first word, seeming so prim and proper, but just growing with mystery with each turn of the page- (SPOILER ALERT)- I even cried a little when she ‘died’. I have to say I am holding onto hope that she will make a reoccurrence in the future novels as I feel there is still so much to learn about her. The novel was split into two- the two sides of a vinyl record (I liked the metaphor! )- however I felt the story was just a bit too disjointed to be all within the same book, when the first ended it then took another 100+ pages to get into the second half. I can’t really say that I saw why the two were linked, being a lover of quick easy reads, I think they possibly could of been better off being split, but that’s just a personal preference. To some degree, I am about to review the beginning and the end separately, as I see them as two different instalments. The first one, I loved. Though a bit slow through the middle ‘search’, the ending shocked me; I did not expect in the slightest for the ‘lady to be in the garden’, or for him to make the penultimate discovery. Although not a ‘happily ever after’ I was quite happy for that to of been THE END. I think because I saw the book as over, I struggled to get into ‘side 2’, so to appreciate it I do have to consider it as a separate instalment in the series. Ree was a great character to introduce, being different from the companion that Nevada was added a different element to the story. I must say I didn’t find her as interesting as some of the others, but she did become a very necessary character for the conclusion of the mystery to make sense. This second instalment I found to be the better one, it had more tension in it, and you saw more of a progression grow throughout the search. However it was quite a bit more predictable. As a whole, I gave this novel a rating of 3 out of 5 stars. It was a tough one to rate as I didn’t at times particularly enjoy reading it, however I have found myself looking forward to the next one to hopefully answer some of the questions that I still have carried over from this one. If you are looking for a fun mystery to read, and just enjoy, then I would highly recommend this. Though not always having that much suspense, it did keep you guessing, and was fun and easy to read. Previous Post Getting back to Work..